'We are proud to have supplied Display Cabinets to Games Workshop, Nottingham Express Transit (N.E.T.) and The Mendip Rail Company. We pride ourselves on providing an excellent service and an excellent product as these happy customers testify: "We are so pleased with our two display cabinets, extremely well made and more than we expected in quality, thanks once again"
"I enquired via e-mail about one of your special offer cabinets on a Sunday and it was delivered to me by Simon the next afternoon, what a service!" "I just wanted to write and thank you for the professional way I have received communication from your company" "After my first request via your website and through to receiving a fully detailed quote in the post, (complete with samples) I have been impressed with the very professional way you have handled your communication with the customer. 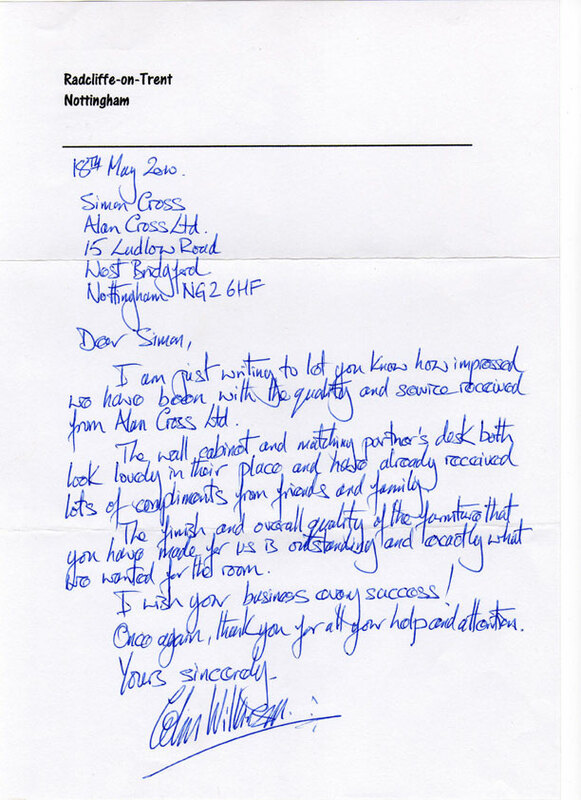 It is nice to see a company doing it's upmost to deliver customer service to a very high standard"
Simon Just a quick note to let you know that Jeff loved the desk and the whole idea has been a complete success. Thank you very much indeed for all your hard work which is much appreciated by all. If you ever want any recommendations, we would be more than happy to do this for you - it is nice to know that there are still some craftsmen left in England. With all our best wishes. I would like to take this opportunity to thank you for your speedy response to my enquiry and I would also like to congratulate you on your outstanding craftsmanship and the quality of your product. With thanks for the excellent service – we’re very pleased with our new doors.